Luke 15:1-7 A star searching for us. Who doesn’t celebrate when a lost soul comes home? When a wayward finds its way? How many times have you prayed for someone to get their act together? You might have even gone looking for them, trying to bring them home to safety, to bring home to some sanity. Or, maybe you just gave up on them. It’s amazing that God chose to be likened to a shepherd, one of the lowest on the totem pole. I don’t think it’s so amazing that we are likened to sheep (and I think we often have it reversed in our minds about who’s who, but that’s another story). 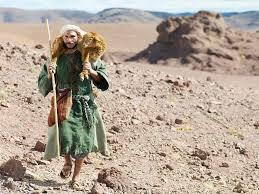 Jesus humbles himself to come after us as a shepherd even though we are the antithesis of who He is. How that drove the religious leaders nuts! Here they are, thinking they are too good for sinners, showing up in their holy than thou lives and clothes, so perfectly manicured and presented, with all sorts of rules on how to prepare themselves… and Jesus is in a simple robe, a commoner, hanging with the sinners, the lowest of the low, to bring them home. That’s who He is through. He’s not about pomp and circumstance. He’s about saving lost souls, about bringing us back home to sanity, about healing. Like a shepherd, He might hobble us if we need it, for our own good, even if we don’t see it that way. I wonder about the 99 who don’t need to repent. Are there that many? Is there even one? Lord, I’m not sure where I’ve wandered off to. Bring me back to the flock. Show me the way.